Precise and Robust, Tissot presents the new Tissot Ladies' PR 100 Silver Dial Bracelet Watch. These new pieces have been launched to give a more modern look in keeping with the time yet still combining traditional watch design using quality materials and the Swiss reliability of the movement. 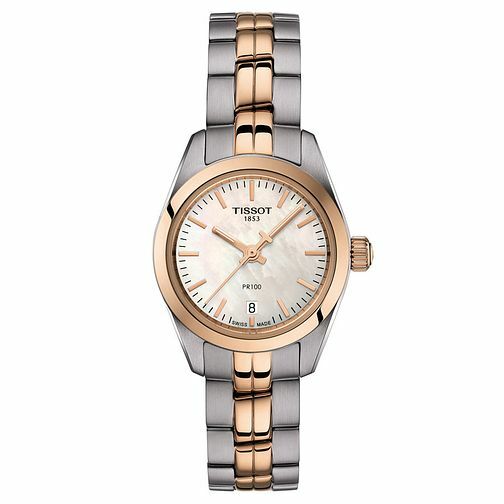 Powered by Swiss quartz, This Tissot Ladies' PR 100 Silver Dial Bracelet watch boasts a polished stainless steel case, and complementary silver tone and rose gold bracelet. The iridescent mother of pearl dial features a date window at 6 o'clock, and rose gold tone hands. This is the ideal watch for fashionable everyday wear.